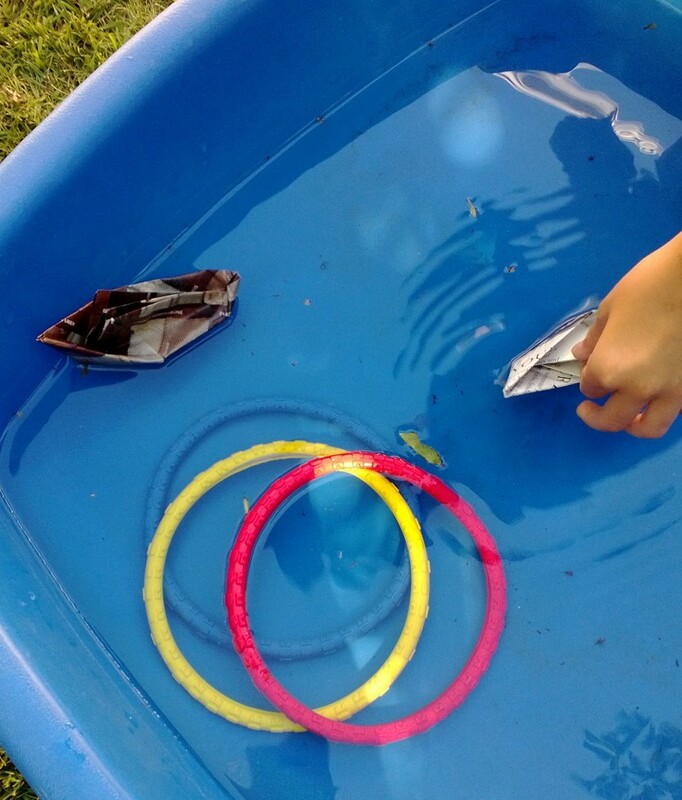 First they were all folding magazine pages to make paper boats. And after testing them on the water table, they were rolling roasted seaweed to make avocado and cucumber sushi. The original idea was to prepare California rolls, but they were not enthusiastic about real crab. 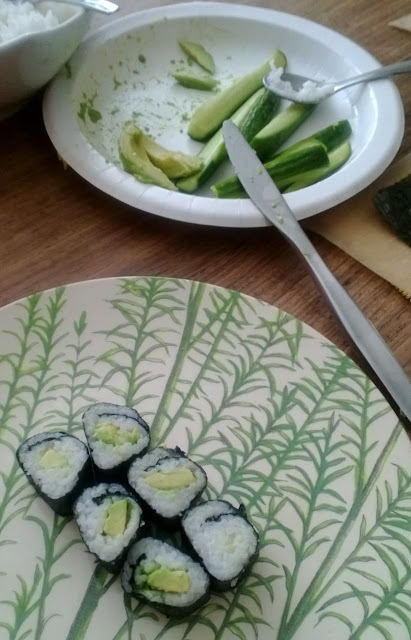 The result was simple and elegant: just rolls filled with cucumber and avocado, or just avocado. After folding paper to make boats, it sounded as easy as it could be. Tiny hands are delicate enough to use the wood rolling mat and the wood paddle. 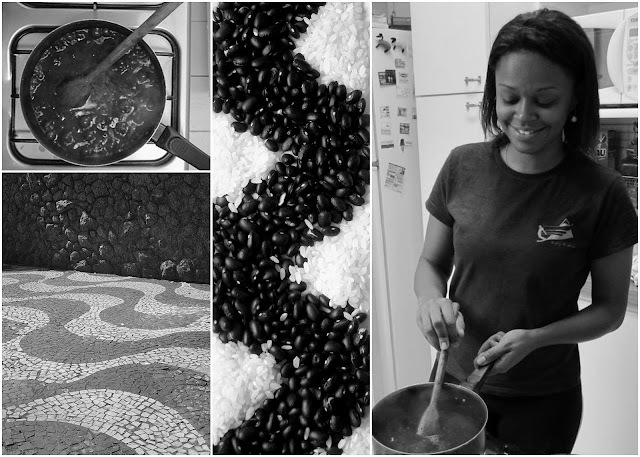 To make the whole process fast and relaxing I asked them to spread the rice on the roasted seaweed, as if they were painting a canvas. Then they chose what ingredients they would like to put inside the roll, and after I sealed the ends of the seaweed they helped me to roll. I put a parchment paper layer in between the mat and seaweed to make sure we wouldn't get sticky rice all over the place. It worked. You could use one of Darienne's egg thin omelette inside, or just have a few ingredients available so to play with them as the children (or grownups) want. I used the Yamamotoyama brand of the roasted seaweed, easily found in grocery stores. Most packages of roasted seaweed have instructions on how to roll a sushi roll. 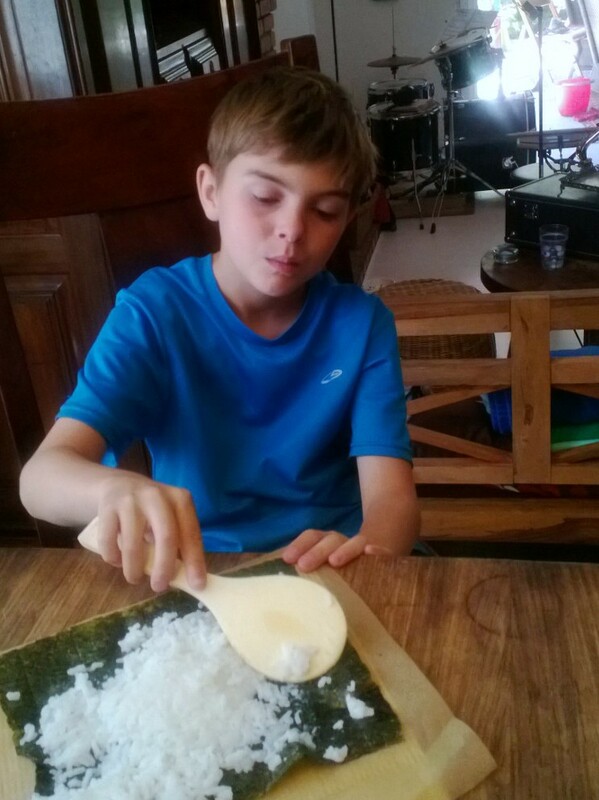 Stretch the cooked rice over the seaweed paper, draw a line with the fillings, moisten the seams with water using your fingertips, and roll it and slice. Once you do it right, you will do it right forever. Like folding paper or riding a bike. Enjoy! 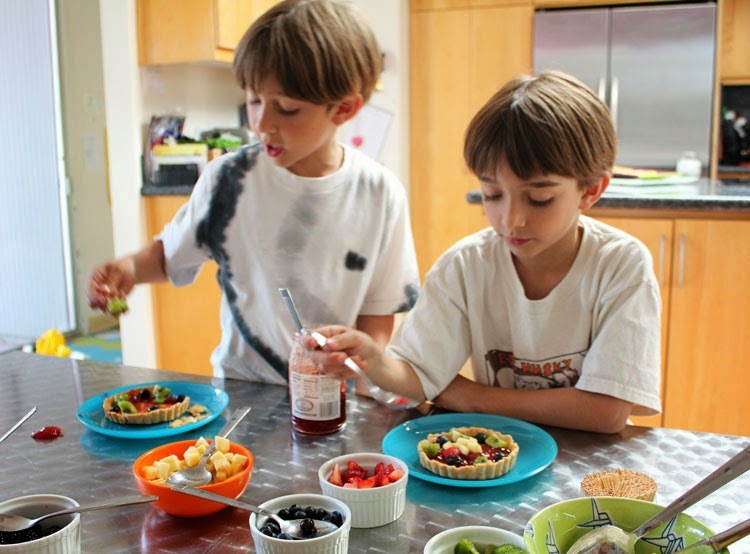 A make-it-yourself bar is one of my favorite ways to coax even the most reluctant kids to help out with preparing food and try new flavors. 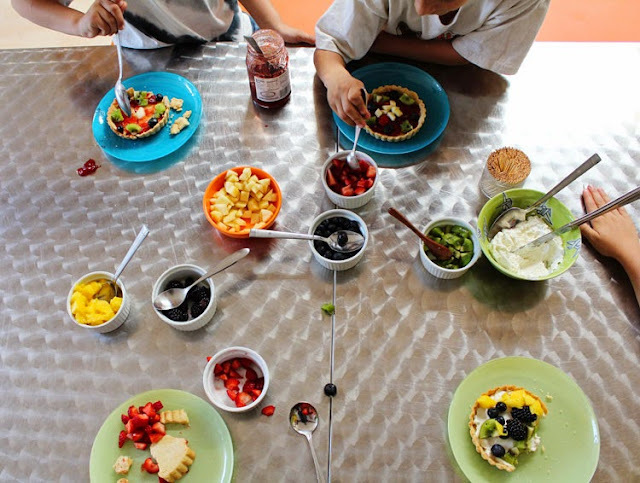 And in summer, it's an especially fun way to relax, laugh, and play at the table together. 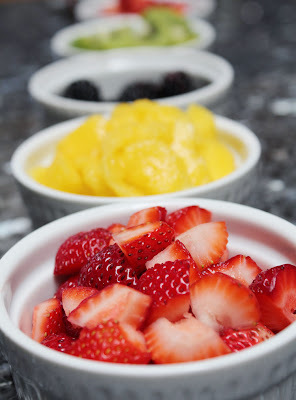 We've been gorging on summer fruit, and I craved something special. Like a pie or tart... but the boys and I all wanted to showcase different fruit. So we used all of them! 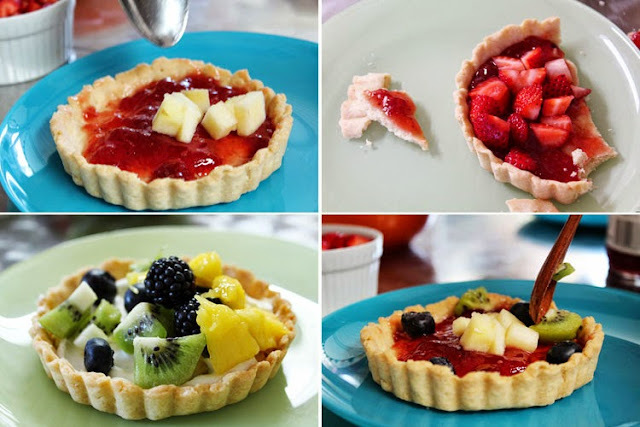 I baked tart shells and cut up fresh fruit. I had almost everything we wanted, except mascarpone. I waffled: Run out to the store? Push this back a day and make fresh mascarpone? 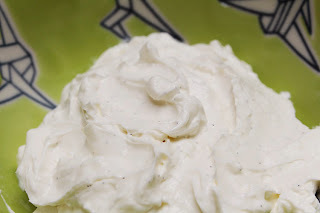 I settled on a third way: Make some Masquerade Mascarpone out of light cream cheese and Greek yogurt, a more-than-decent stand-in for the real thing. I set it all out on the table and the let the kids go to work. 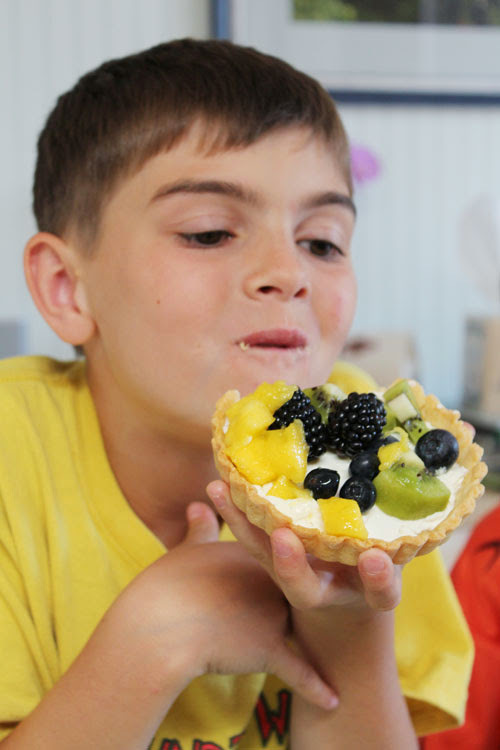 They built beautiful small-scale masterpieces and then happily devoured them. 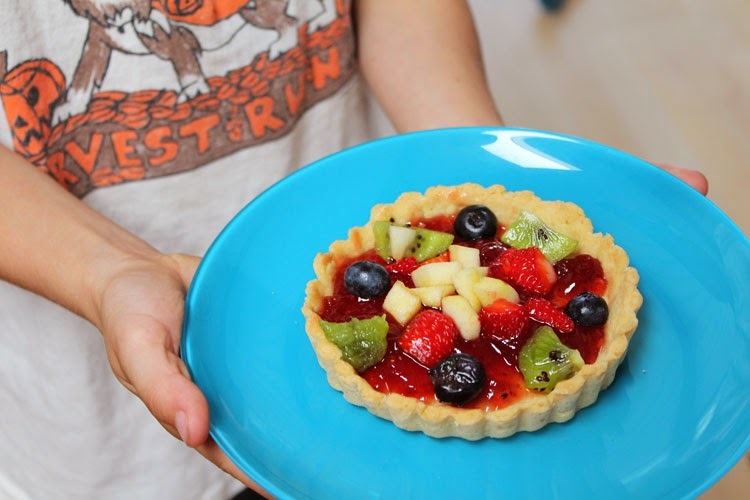 It had been a while since we'd enjoyed a make-it-yourself treat. It was a good reminder that food is best enjoyed with good company and good fun. For more ideas, check out how we've done build-it-yourself bars for homemade pizza grilled cheese, fall fruit salad, mini fruit tartelettes, and chocolates. Set out tart shells, filling options, and fruit and invite everyone build their perfect fruit tart. Mascarpone is simple to make, but you need 24 hours’ lead time and tartaric acid, which admittedly is not a pantry staple. This quick alternative is a great stand-in — and much lighter than the real thing. Combine all ingredients and blend well. Refrigerate a few hours, if possible, for deeper flavor. Store in the refrigerator for a week or two.